Discussion in 'Online Casino Promotions' started by Kotsy, Mar 11, 2014.
playing the Game of the Month Promotion. 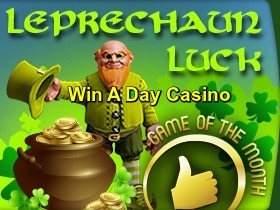 Log in and play Lucky Leprechauns and you'll be on your way to get in on winning. For every 500 spins you take on Lucky Leprechaun video slot, you'll earn one ticket into the drawing of a total prize pool of $500. One player will win $250, one will win $100, and 3 lucky leprechauns will win $50 each. Winnings only need to be played through 1x before requesting a cashout.